Sprinkler Master (Fresno, CA) - We Repair Fresno County Sprinkers! We Repair Fresno County Sprinkers! WE REPAIR FRESNO COUNTY SPRINKLERS! Drip irrigation systems put water directly into the soil, without losing almost any water to evaporation or going where you don’t need it. This allows your plants to get enough water without wasting any. Install today in Fresno, California to save on water and money! We now install Skydrop sprinkler timers in the Fresno area, which can reduce your water usage up to 30%! 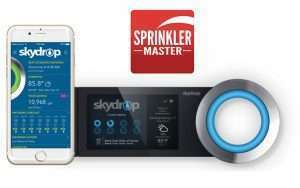 Skydrop timers track local weather patterns and shut off your sprinkler system when it doesn’t need it. Wanting to install a new control timer in your home? Give Sprinkler Master a call! Sprinkler valves control whether or not your sprinkler heads get water. If one of them is broken, it can cause dry spots and other issues. If you suspect you may have a problem with your sprinkler valves, give Sprinkler Master Fresno a call! A broken nozzle can prevent your system from watering correctly. If your sprinkler heads are having trouble getting water where it needs to be, we can help! We are the best sprinkler repair company in Fresno, California! Sprinkler heads can get run over and broken, shooting water into the air. If you’ve had one of your sprinkler heads broken and need a replacement, give us a call! Are you looking to expand? We can help! Adding a sprinkler head to a system can be a laborious process, but our techs have done it many times, and are ready to help! If you want to add new sprinkler heads to your system, give the masters a call! Broken lines can be a serious issue, causing flooding to your home, and dry spots or swampy areas in your yard. Broken lines need to be addressed immediately. If any of these symptoms appear in your home, give Sprinkler Master Fresno a call immediately. Winterizing your sprinkler system is an important step in protecting your sprinkler system. Without blowing out your pipes, the leftover water in them may freeze and expand, breaking pipes and ruining heads. Keep your system safe by giving Sprinkler Master a call! Sometimes, a sprinkler head can get offset, and start watering places where you don't want it to. In this case, we simply need to reset the sprinkler heads. Need a hand? Give the masters a call! Lawn Sprinkler Repair Fresno County, CA.